Industrial and warehouse mobile computer for fixed mounting. Datalogic SH21 is a highly robust computer for fixed mounting, and as such is optimally suited for the stringent requirements in industrial and warehousing work areas. Although the 3 mm armor-plated glass protects its capacitive 21'' multi-touch screen against damages, it remains easily operable even while wearing gloves. The housing of the Made in Germany computer meets IP65 and IP67 standards for protection against dust and splash water; therefore it keeps on working even in dirty or rainy areas. With a resolution of 1,920 x 1,080 pixels and 300 nits of bright LED backlighting, the SH21 Blackline ideally displays contents, even in poor lighting conditions. This is ensured by, among others, the anti-glare coating on the display's surface. For processing power there is an Intel Quad Core available, as well as an Intel Core i5. If the SH21 moves to a new work location its optional backup battery provides 30 minutes of independent energy. To extend its application areas connect a keyboard, barcode scanner and many other accessories, even wirelessly via Bluetooth. Datalogic is pleased to introduce the Blackline series of industrial computers. The SH15 Blackline computer is a rugged vehicle mount computer (VMC) as well as a fixed mount unit for use in any industrial application. 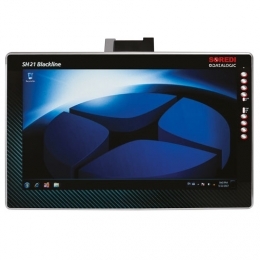 The SH21 Blackline computer is an industrial computer designed for wall or fixed mount industrial applications. A sealed design tested to IP65/IP67 ensures operation for both computers in the toughest environments. The Capacitive Touch models feature a 3 mm anti-glare armored glass which can be used even when wearing gloves. The SH15 Blackline computer increases productivity through reduced errors during receiving, put-away, picking and shipping activities. The SH21 Blackline computer increases productivity by allowing a high level of interaction between operators and machines, giving users the ability to open technical drawings, videos and work steps. Adding a hand held bar code scanner such as Datalogic’s PowerScan™ 9500 scanner to either computer allows for quick data entry and location confirmations. The SH15 Blackline computer is equipped with an internal isolated DC power supply, ignition sense to automatically control the power in VMC applications, and an AC internal power supply for fixed mount solutions. The SH21 computer is equipped with a high efficiency AC internal power supply. Both computers fit different mounting and space constraints, including various brackets and RAM mounts for the vehicle/wall computer along with ABCD or QWERTY external keyboards. A dedicated software keyboard includes a multitude of layouts and languages, adapting either Blackline computer to a minimum footprint for global applications. Both computers offer a choice of Windows Embedded Standard 7 or Windows® 10 IoT Enterprise operating systems. Included are various Datalogic Utilities. Compatibility with various MDM’s and Terminal Emulation allow both Blackline computers to maximize their return on investment (ROI) through easy deployment, device and maintenance management.